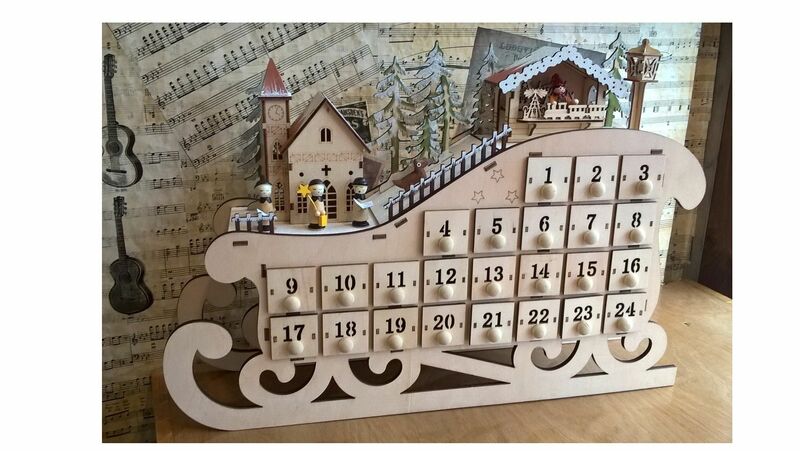 A beautiful wooden musical advent sleigh. This very unusual Christmas ornament will enhance your Christmas decorations this year. 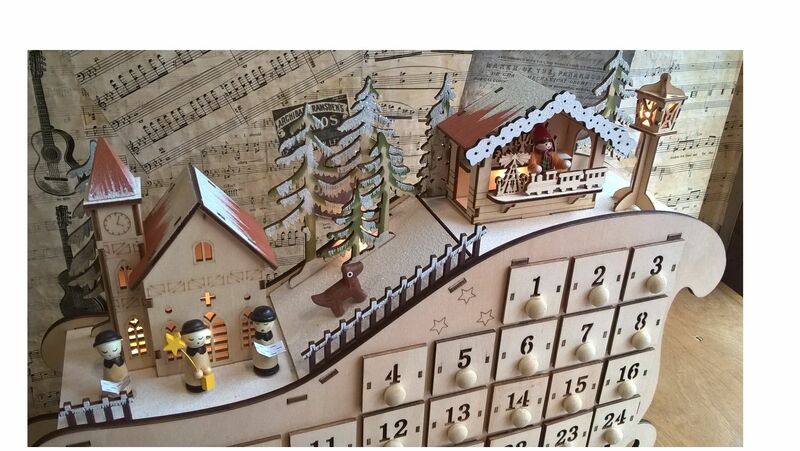 The advent doors are set into the side of a wooden sleigh which has a Christmas scene on the top. The scene comprises a church with three choristers stood in front, an alpine slope with trees and a dog positioned as though ascending the slope. At the top of the slope there is a Christmas market stall selling wooden toys. There is also a street lamp next to the stall. The church, stall and lamp will light up if batteries are fitted into the battery compartment. 2AA batteries are required for the lights (not supplied). There is a musical movement fitted into the back of the sleigh and this is wound by a key. The movement can be stopped and started by a push / pull knob set into the left hand side of the sleigh. The 24 drawers set into the front of the sleigh measure approximately 3cm x 3cm x 2cm deep each and so will hold a small item or message. 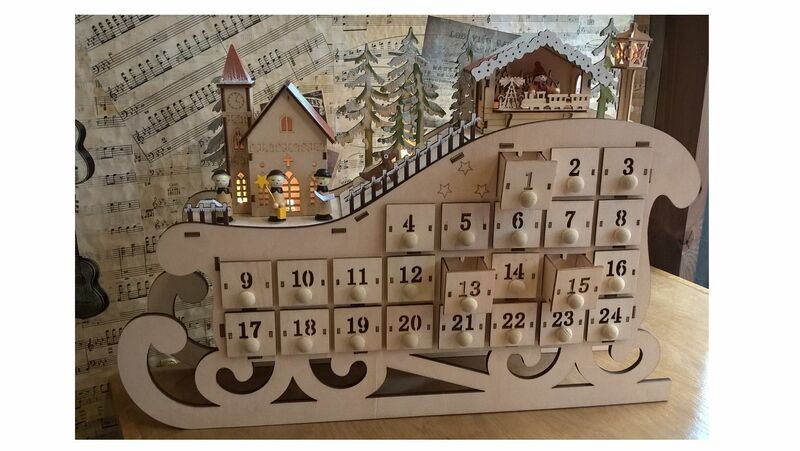 This Christmas advent sleigh is very well finished and will be a treasured Christmas decoration for many years. The musical movement plays the tune: Oh Christmas Tree. 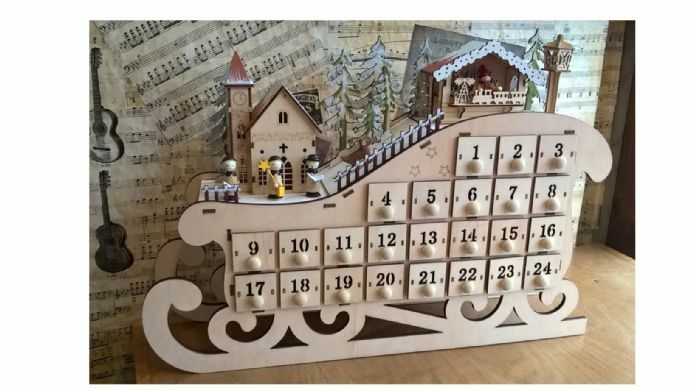 IMPORTANT NOTICE - Please be aware that this advent sleigh is an ornament and is not a toy and as such is not suitable for children as it does contain small parts, and if demonstrating them to children it must be done under adult supervision. If you are unsure about suitability, please telephone and ask one of our staff for guidance.